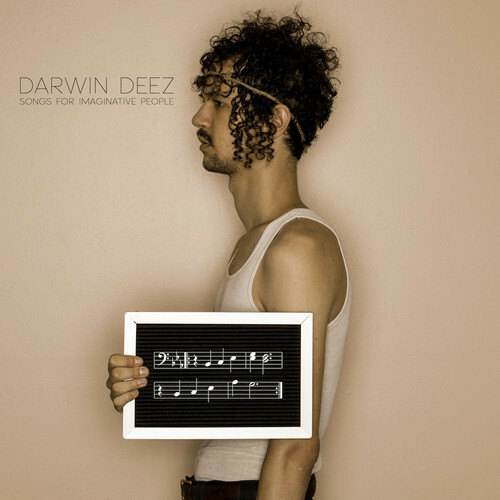 Darwin Deez, applying the most subtle of tactics, has snuck up nearly out of nowhere (save for an album announcement last November) with his sophomore album Songs For Imaginative People. With the LP set to release next Tuesday, the Darwin-led outfit is giving us the chance to stream the whole thing prior to its release. Listen to all ten tracks from the "rockier and wordier" album below, and hit the jump to read a track-by-track guide written by Darwin Deez himself. Songs For Imaginative People is out on February 12th. Anthem for existentialists. Samples Autechre. '(800) HUMAN' is kind of a big 'what if' - what if before we got here we were all just bored disembodied spirits - angels - wasting away, watching the heavenly equivalent of lame infomercials, one of which was for the corporeal experience of humanity, and so we took the bait, and then once we got to earth we forgot how we got here (an inevitable part of the 'fine print' of birth), why we came here, and couldn't remember anything but the melody used on that commercial? That's the song. Sometimes life depresses you and makes you want to waste away and watch TV. Even for angels. But the song is a prayer for deliverance from the existential inauthenticity of that kind of laziness and submission. Plus, the ooh-melody at the end of the song is depicted on the cover. And it is the same basic melody of the chorus. So if the chorus is the jingle to the infomercial for humanity, then the ooh-melody is "how the jingle goes". See what I did there? A true story about a wild child I once met and fell for. Guitar solo inspired by Q and not U's song 'Fever Sleeves'. I've been holding onto that bit of inspiration for 10 years. A new original 80s banger about romance gone stale. Features an awesome shred solo. It's time to bring those back to indie rock if you ask me. When I started on this album I thought I would need to hire someone else to do these guitar solos for me. I ended up spending so much time practicing them that I was able to do them myself. Classic Aries, classic me... I love to do everything myself. That's why I am a solo artist. An icy cruiser about being dissed by my ex at a party. I shared this song with a friend on the way home from a wedding after he got dissed by a girl there. Coincidentally she was wearing a blue dress. This song extols the virtues of slackerdom. In the year I took to compose this album I also did some spectacular slacking off. I wrote this song for myself and also my neighbor Breigh who was only working part-time at the time and feeling creatively stifled. Now she's full-time and fully stressed. Breigh and her husband did the layout for the album. This is a song for my Australian lover, Alice, and also for my friends Rani (Australian) and Meg (American) who keep in close touch via Skype and Facebook. I wrote this early on in the album process. I found it nice to revisit the classic inspiration of "writing a song for someone" which had been absent from my approach for just long enough. This one's about the desperation I went through at the end of a dying romance. The title refers to the doppler effect as experienced in light waves, specifically light from distant stars. As a light source moves away from you, the frequency of the light is decreased. Just like the pitch of a siren or car horn as it passed you. This observable astronomical phenomenon is the basis of the big bang theory. Wasn't trying to be esoteric here, I thought we all learned this stuff in high school science class. Another song of solidarity with existentialists. 'God is dead' is not about atheism vs theists. Actually if you go back to the quote in context, the next page in gay science is about radical new horizon of freedom that results. Sadness and mourning part of it too though, hence the b-section vibe. A song about hope and despair in the modern world. An homage to my 6 years at angelica kitchen where I worked as an expeditor and a server. I seriously considered volunteering at a local jail but wrote this song instead. I am a dreamer and I live through fantasy. Sometimes I feel like I'm not getting anywhere in life and on top of that my heart is broken or breaking but I never stop believing that happiness is possible and that happiness is easy if you can figure it out. Kind of spiritual. An old friend who suddenly seemed like more inspired this song. Subconsciously I felt like a carpetbagger moving to Asheville to take advantage of its awesomeness, not needing a job outside of music, hanging with young adults and relaxing in the mountainous beauty. Again with the fantasies.